A fantastic blue sky light/no wind sunny day with a great forecast greated me as I rose from bed far earlier than normal for a Sunday ! I was off to Kemeys Commander to meet some friends flying in from Kemble to meet me before heading off to Swansea and the Gower coastline for the day. I arrived at the strip early and set about getting “red sparrow” out of the hangar (erm barn?) and free wheeled her down the ramp onto the grass apron. I lugged the gerry cans from the car and added a whole 40 litres of unleaded into the tank giving me the full 60 litres on board ready for a day out. Around 0930 I turned on the airband radio to listen out for Paul in G-IMUP and Alan in G-BYFF (my old machine). I heard them, but they were calling they were “overhead”" yet I heard no engines or saw no aircraft ! Uh-oh. A couple of radio calls later and I’d established they were over a nearby airfield used for gliding, oops. I directed them towards the reservoir and they soon spotted my strip. Soon we were all togged up again and starting up ready to depart and afer a wee hitch we taxied down the runway to the far end. 1…….2…..3 we all roared down the grass and into the air turning left towards the South Wales Valleys. It was lovely up there and as Alan dissapeared off into the distance like a bat out of hell, Paul and Tracey in his Air Creation Tanarg G-IMUP and myself in G-CBLX took our time ambling along at 55/60mph enjoying the stunning deap valleys of South Wales as we tracked West passing North of Cardiff and on to Swansea. 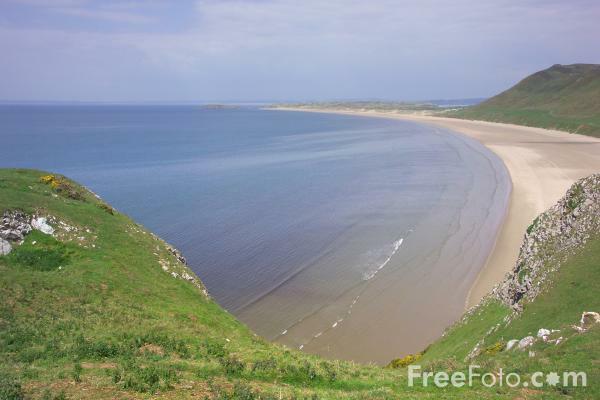 Swansea was soon on the nose, the bay and the Gower coastline beyond looking great in the sun. We overheard instructions along these lines to earlier arriving aircraft and so, IMUP and I (CBLX) both called Swansea Radio and advised we’d pass to the North, turn around overhead LLanelli and join downwind. By the time IMUP and I had taxied to the Apron, Alan in BYFF had already made it to the pumps and refuelled. We all paid our £5 landing fee each (bargain, good value Swansea) and headed to the cafe for some nosh. Swansea has a good cafe and we all had some form of bacon/sausage butty or full cardiac breakfast and a steaming mug of tea. Nice. Staggering stuffed into the sunshine, Paul felt a bit sick, seems the greasy hadnt gone down well. So, we relaxed a bit, admired the nice 3 Icarus fixed wing microlights belonging to Swansea Sport Flying microlight school and had some chat with two other microlighters who’d flown down from Wolverhampton Halfpenny Green. In no time Paul perked up and we prepared to depart. “Overhead Alan” and Andy in BYFF were off to land on a friends golf course somewhere near Haverford West. Paul, Tracey and I decided to do a bimble around the gower before heading home. Soon we were all off the tarmac and BYFF zoomed off. Empty here the beach was very busy when we flew along it. Paul and Tracey in BYFF and I in CBLX headed out to the coast and had a flight along the cliffs and then turned North along Rhossili Beach on the end of the Gower Peninsula. The beaches were busy, many kayaks in the water, many sunbathers, even some kite buggies bombing along the beach. 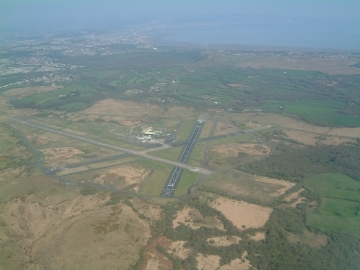 Then we turned East and headed back homewards passing the Swansea Airfield again and on into South East Wales. Before long Llandegforrd Reservoir came up on the nose and I bid Paul, Tracey in G-BYFF fairwell as they peeled off to the right to cross the Severn into England and back to Kemble. I was soon back on the ground at Kemeys. It had been a lovely day out with friends, some great flying, some great banter.